Rhombus Hotel - tse gotel klas "luxury". We are not only happy to receive our guests of the earth and tourists, but because of our pleasure, we have a wonderful view to the inhabitants of our city. Use the service, comfort and comfort of guests, at the same time, at the most promising - special numbers, interiors, viconians and geometric conceptualists, personnel of the high-level professional activities. At the reception, you will be enthralled with the help of the property, you will need to add a number and tell about the services provided by the hotel. In іdeyu gotelu laid іndivіdualny p_dhіd to skin guest. Otzhe, be ready, scho literally for kilka khvilin you pіdberut іdеalnyy varіant sama for your vіdpochninku. Romantic uykend in the very heart of the historical and cultural cultural reserve “Pere Misto” And with a cure for us, they began to us, we know for sure, just zapononuvate yourself. We have been talking about those scabs on the skin number, you could feel like yak udoma. The skin guest of ours is obovyazeko very safe with a bathrobe, caps, shampoo, sweet, shower gel, hair dryer and use of the necessary essentials. Such baths have a shower with showers, baths, bidet and washbasins. Velikі zruchnі lіzhka rozmіru king size (160x200 cm) give you a gift korolіvsky dream. At the skin room, they were set up by an air conditioner, a smart TV with a modern touch screen, Wi-Fi and a mini bar. And at the numbers that are in need, there is one day you can adjust to the color and light of the light, and also an audio system can connect to your smartphone via Bluetooth. At the Rhombus Hotel, you can also find rooms with balconies and terrace - you can enjoy the evening of the night, on the same day, enjoy the beautiful beauty, over a cup of tea or a cup of sweet wine. 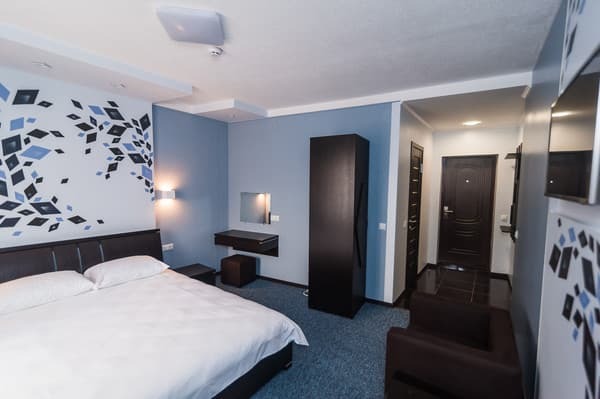 Varto zachizniti, scho Rhombus Hotel pratsyu u є European style, that the visitor on the ussim guests chekatime sweeping snіdanok, a kind of inclusions in the room. We are accustomed to being an A la Carte type of food, if you have the flexibility to turn around the menu from the menu prepared by the Hotel. In addition, the guests of the hotel will be able to unwind at home, take a walk on the boat (afterwards will be available in spring 2019) or vlachtuvati sobny relax at the banya de basen and you can remember. For drain the armored room number on the two that more dobeti - the year in the bath in the bath without bekoshtovno, but also a walker on the boat (on the spring of 2019 rock) in the courtyard for you. At the time of the heat of the rock bіlya gotelu you can take a sleepy baths and otrimati garnu zsamagu. The hotel of rozmashovyaniy in the highest part of the mista - in the historical “Old Lutsk” reserve on the birch market “Stir”! On the territory of the reserve, there are 52 pods under the state power, of which 39 are of national significance. Usi nyviznichny pam The words of these memorials to the leaders of Ukraine - Ivan Vigovsky, Danil Bratkovsky, Petro Mohyla, Iowa Kondzelevich. On the territory of the reserve, museum mortgages are the Museum of the Book, the European Museum of Animals, the pharmacy museum, the Lesina Vitalnaya memorial museum, the art museum that is most interesting. I myself here, not far from the hotel, is proud of Luts'ka, Missou, who was taking pictures of the 200-hryvnia banknote - Lyubarta Castle (Upper Castle) - the great fortress of the middle. The castle is not a depot to the museums of the exhibition - win є its own cultural scene of Luck, take place at various festivals, shows, societies and tournaments, contests, concerts, cultural shows. On the territory of the Rhombus Hotel, the visitor will be provided with a parking lot for cars, malih and great buses. In addition, do not start thinking about those who have left their car for an hour for a period of time and a little on the parking lots. And for kіlka metrіv vіd gotelu prutsyu tsilodobova avtomiyika and tire service “High Wei” - there indulge about your car, and you can play at a billiard in this hour. Having settled down at the Rhombus Hotel, you should be in the very heart of the city. Have a good day, at about ten o'clock, at least an indefinitely happy guest of skin. When you have done it once, you can tell that unforgettable hostile sponukayut you turn your head. Description of the room: The room is two two-three-one-one beds, 90x200 cm, of those rosaries on two axles. Кімната світла that is stylish, with the designer's repair. At number є a bath of kimnata z sііm neobhіdnimi vannimi prіnalezhnostyami - a dressing gown, kaptsyami, the hair dryer тощо. Comfortable pictures to secure Smart TV and bezishtovny Wi-Fi. Також у номері є міні-бар. Description of the room: Svitliy is a stylish room for inspiring robotics. Velikie Lizhko Queen Size 160x200 cm give zmogu rozlaslitisya після туристичної прогулянки чи бізнес зустрічей. The room has a bathtub with a shower, a toilet, a bathrobe, a cap, a hairdryer, and a bathroom with a shower. That's the number of equipment Smart-TV that dockless Wi-Fi. Description of the room: Prostorium that svitliy number for a comfortable look with a great dvopalnim lizhk 160h200 cm, that balcony. Ideally pidhodit for quiet, hto priehhav on vidpochinok to Lutsk doubled. At number є zruchnoj dushova kabina, unitaz z functitsіyu bіde, khalat, kaptsi, fen ta usі neobhіdnі vannі pranalezhnotі. Takozhi va matimete zmugu zaslobitya podolodzhuuchis yakisnoyu kartikoju dіodnogo telvіzora зі Smart-TV та безкоштовним Wi-Fi. Description of the room: Prostorium room for a comfortable look with a great dvispalnym lizhkom 160h200 cm that balcony. Ideally pidhodit for quiet, hto priehhav on vidpochinok to Lutsk doubled. At the room there is a bathtub, a toilet, a bathrobe, a capstan, a hairdryer, a whisk and a bath. Takozhi va matimete zmugu zaslobitisya podolodzhuychis yakisnoyu kachestvoyu per hour televizora zi Smart-TV te dzokoshtvimim Wi-Fi. Description of the room: Classical coverings number to go for quiet, hto tsinu comfort vіdpochinok for pomіrnu tsіnu. The stylish room is 20 square meters in size for 1 + 1 person, two large single beds are 90x200 cm. Takozh at the room is Smart TV, which has Wi-Fi, a bathrobe, a cap, a hairdryer and a TV set. Children to 12 rokіv rozmіschyuyutsya beskoshtovno. The skin number номер can dovetid dіtyachі lіzhka. The rooms 1,2,3,4,10,14 є great non-recyclable divani. Vartі datatkovogo mattress 250 UAH. The price includes breakfast. There is a bar on site. The hotel of rozmashovyaniy in the highest part of the mista - in the historical “Old Lutsk” reserve on the birch market “Stir”! On the territory of the reserve, there are 52 pods under the state power, of which 39 are of national significance. Usi nyviznichny pam The words of these memorials to the leaders of Ukraine - Ivan Vigovsky, Danil Bratkovsky, Petro Mohyla, Iowa Kondzelevich. On the territory of the reserve, museum mortgages are the Museum of the Book, the European Museum of Animals, the pharmacy museum, the Lesina Vitalnaya memorial museum, the art museum that is most interesting. I myself here, not far from the hotel, is proud of Luts'ka, Missou, who was taking pictures of the 200-hryvnia banknote - Lyubarta Castle (Upper Castle) - the great fortress of the middle. The castle is not a depot to the museums of the exhibition - win є its own cultural scene of Luck, take place at various festivals, shows, societies and tournaments, contests, concerts, cultural shows.